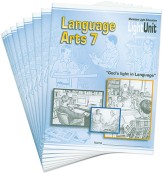 Sunrise Language Arts 100 correlates with Christian Light's Learning to Read and Sunrise Reading 100, but fits well with any phonics-based learning-to-read program. This thorough, phonics-based program teaches grammar, punctuation, communication skills, writing, spelling, and penmanship. Concepts in the LightUnits are taught in small increments and reviewed over and over again to ensure mastery. Wall charts illustrate spelling and punctuation rules. Children who need extra penmanship practice will enjoy the beautifully illustrated workbook I Can Write Manuscript as they practice copying letters, numbers, words, short sentences, and simple poems on the theme of animal babies and their mothers. 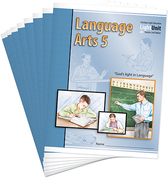 Extra Language Arts practice sheets are available for those who need more drill. The Teacher's Guide includes answers to the LightUnits, ideas, spelling word lists, useful appendices, and alternate LightUnit tests for students who need to redo a test. A 80+ full-color phonics card set is available for Language Arts 100. These cards illustrate and give practice words for the pronunciation rules taught in Christian Light's Reading and Language Arts. Revised materials will not work with the older course. Sunrise 2nd Edition Language Arts 200 integrates grammar, spelling, and penmanship into one easy-to-use course. Each lesson begins with grammar and punctuation skills introduced in small increments. Next is review on material from the previous lesson and some of the material from earlier lessons. A daily penmanship activity is followed by practice on a weekly spelling word list. Language Arts 300 teaches grammar, spelling, and penmanship. Students identify nouns, verbs, adjectives, and sentence subject, and begin diagramming. Language mechanics taught include punctuation, capitalization, and subject-verb agreement. A creative writing lesson is in each Light-Unit. Students learn to use contents pages, indexes, dictionaries, and encyclopedias. The Reference Chart explains parts of speech, punctuation, and more. 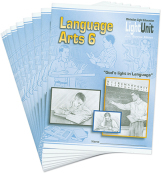 The Teacher’s Guide includes LightUnit pages with answers, review questions, teaching tips, alternate tests, scope and sequence, a glossary, and spelling words. 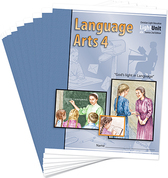 Sunrise 2nd Edition Language Arts 400 integrates grammar, spelling, and penmanship. In addition to basic English skills, students learn to research information using encyclopedias and personal interviews, to listen and take notes, and to scan for specific information. 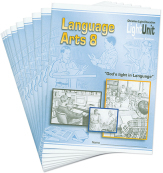 Each LightUnit includes two creative writing lessons. Use our Language Arts Diagnostic Test to correctly place new students. The teacher should monitor the child’s daily work, but students do many exercises independently. Use the Extra Practice Sheets for specific review on difficult concepts. The Answer Key contains reproductions of LightUnit pages with answers and is spiral bound. The Quiz and Test Answer Key is required if you purchase the spiral-bound LightUnit Answer Key. The Teacher’s Guide includes teaching notes, spelling word lists, LightUnit pages with answers, and alternate tests. The Answer Key is spiral bound and contains reproductions of the LightUnit pages with answers. The Teacher's Guide provides teaching notes, spelling word lists, LightUnit pages with answers, and alternate LightUnit tests. 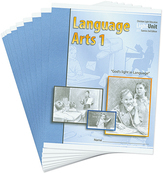 Language Arts 600 integrates grammar, spelling, and penmanship into one easy-to-use package. Grammar and punctuation skills are introduced incrementally at the beginning of each daily lesson, followed by exercises reviewing the latest material as well as more familiar, almost-mastered skills. Each day’s lesson concludes with penmanship and spelling practice. In addition to the basic English skills, students study pronoun case and person as well as conjunctions and interjections. They learn to recognize and diagram appositives, complements, and direct and indirect objects in sentences. This study contains indepth paragraph writing based on the book On Teaching Writing. The optional Teacher's Guide provides teacher's notes, spelling word lists, useful appendices, and alternate LightUnit tests. 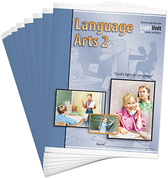 Language Arts 700 integrates grammar, spelling, and penmanship into one easy-to-use package. Grammar and punctuation skills are introduced incrementally at the beginning of each daily lesson, followed by exercises reviewing the latest material as well as more familiar, almost-mastered skills. Each day’s lesson concludes with penmanship and spelling practice. In LightUnit 707, students read But Not Forsaken, a book about refugees after WWII, and do a literary analysis of the story. This full-year course also covers active and passive voice, verbals, clauses, compound and complex sentence structure, writing an exposition, consistent verb tenses, and dangling/misplaced modifiers. Language Arts 800 integrates grammar, spelling, and penmanship into one easy-to-use package. Grammar and punctuation skills are introduced incrementally at the beginning of each daily lesson, followed by exercises reviewing the freshest material as well as more familiar, almost-mastered skills. Each day’s lesson concludes with penmanship and spelling practice. This full-year course includes a research paper project for the student to complete along with a standard bibliography. They are taught how to choose vivid verbs and eliminate redundancy in their writing. Also covered are transitive/intransitive verbs, basic and perfect tenses, concrete/abstract nouns, categorizing pronouns, elliptical clauses, and figures of speech. The Teacher's Guide provides teacher's notes, spelling word lists, useful appendices, and alternate LightUnit tests.